Over a number of years I have had the pleasure of writing and producing numerous radio documentaries for broadcasters in the UK. Outlined below is a summary of some of my favourite programmes, most of which are one-hour shows, with a few special two-part programmes. 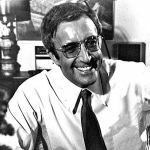 Peter Sellers: A candid insight into the life of this comic genius. The programme explores Peter’s life, his many loves and his career, including going behind the scenes of the infamous BBC comedy series, The Goons and the classic Pink Panther films. Contributions include his friend Graham Stark and an in-depth and often quite frank interview with Peter’s son, Michael Sellers. 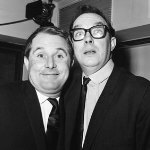 Morecambe and Wise: A special two-part documentary that pays tribute to Britain’s favourite comedy duo. The programme tells the story of the pair’s rise to stardom through the music halls and their progression onto television, where they became the nation’s favourite for over a decade. Contributions include in-depth interviews with Eric’s widow, Joan and their son, Gary. 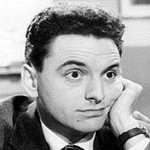 Bob Monkhouse: Recorded in his dressing room shortly before he went on stage to entertain another full house, Bob speaks openly about his life and his career. He recounts his childhood, his passion for films, being typecast by some as a game show host and working with some of the world’s greatest performers, including Bob Hope and Rosemary Clooney. 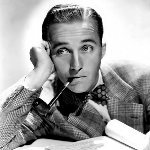 Bing Crosby: A special two-part documentary produced to mark Bing’s centenary in 2004 that explores his life, his career and the family saga that led to an unfavourable biography from his son. Includes contributions from record producer Ken Barnes, band leader Pete Moore, biographer Charles Thompson, singer Rosemary Clooney and Bing’s nephew Howard Crosby. 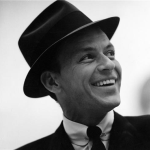 Frank Sinatra: One of Hollywood’s most colourful crooners is celebrated with an in-depth contribution from Charles Pignone, an executive at Frank Sinatra Enterprises in Los Angeles and the author of the definitive coffee table reference book on the singer, The Sinatra Treasures. The programme explores Frank’s life and career, his rise to fame and his enduring appeal. 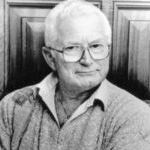 David Croft: Undoubtedly the single most influential figure in British television comedy and the man behind many of the most successful series from the BBC’s golden age in the 1970s, including Dad’s Army, Are You Being Served and Hi-De-Hi. The programme includes an in-depth interview with David, along with contributions from Jimmy Perry, Ruth Madoc and Frank Williams. 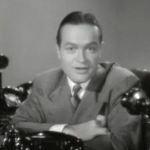 Bob Hope: A special tribute to one of Britain’s most famous sons, and one of the biggest comedy stars of the twentieth century on film, radio and television. Bob’s extensive career in Vaudeville, on the silver screen, radio and latterly television spanned eight decades.The programme includes contributions from producer Ken Barnes and comedy hero Bob Monkhouse. 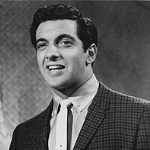 Frankie Vaughan: Author and music historian Malcolm MacFarlane pays tribute to the extraordinary and inspirational life of the singer Frankie Vaughan. The programme explores Frankie’s rise to fame and his decades at the top of his profession, as well as his work for charity, including the Boys Brigade, which played such an important part in his early life. 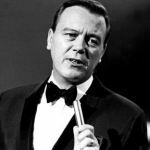 Matt Monro: An affectionate tribute to the man they call ‘the singer’s singer’. Matt was regarded as Britain’s Frank Sinatra and he enjoyed an international signing career with chart topping albums and sell out concerts around the world. 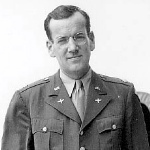 The programme includes in-depth contributions from his widow Mickie, his daughter Michelle and his son Matt Monro Jr.
Glenn Miller: The programme was recorded on location at the Glenn Miller Museum at the former RAF Twinwood air base in Bedfordshire, from where Glenn took-off the night that he mysteriously disappeared on 15 December 1944. The programme explores the museum and the recently restored control tower, as well as celebrating Glenn’s music and his career. Holiday Inn: The programme celebrated the 60th anniversary of the 1943 film that starred Bing Crosby, Fred Astaire, Virginia Dale and Marjorie Reynolds. The film is also famous for having introduced Irving Berlin’s classic song, White Christmas, which has gone on to become one of the biggest selling songs of all time and a seasonal favourite around the world. The Road Movies: One of the most popular comedy film series to emerge from Hollywood were the ‘Road Movies’ that starred Bing Crosby, Bob Hope and Dorothy Lamour. The programme tells the story of how the trio entertained audiences with a series of films that began with Road to Singapore in 1940 and ended on the Road to Hong Kong twenty-two years later in 1962.